Margery A. Besonen of Owatonna died April 2, 2019 at the Owatonna Hospital. Mass of Christian Burial is set for Saturday, April 6, 2019 at 11:00 a.m. at Sacred Heart Catholic Church in Owatonna. Friends may greet the family on Friday, April 5, 2019 from 4-7 p.m. at the Brick – Meger Funeral Home (1603 – Austin Road, Owatonna) and one hour prior to the funeral liturgy on Saturday. A Parish Rosary will be recited at 3:45 p.m. on Friday at the funeral home. Margery Ann was born August 2, 1929 in Cogswell, ND, the daughter of George and Sabina (Klinkhammer) Kummeth. The family relocated to Owatonna during her childhood. 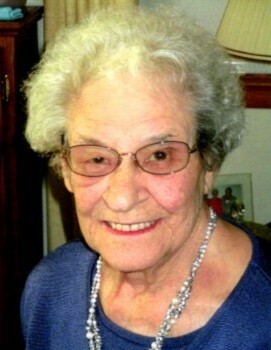 Marge attended school at St. Mary’s Academy and later graduated from Owatonna High School in 1946. After high school, Marge worked at Jostens. She was united in marriage to Gordon W. Besonen on October 25, 1952 in San Diego, CA. This union brought three children Jodi, Dale, and Lynn. Marge was a devoted mother to her family. Her husband was disabled in 1969 and Marge was his primary caregiver until his death in 1992. Marge was a lifelong member of Sacred Heart Church. She was fond of many Minnesota sports teams and followed them enthusiastically. An avid Jeopardy fan, her family knew to avoid calling at 4:30 p.m. She could often be found at the card table, beating her opponents at whist. Despite their losses, they looked forward to their consolation prize of homemade “Marge bars” and potato salad. Her greatest joy in life was the time she spent with her family, where there was always love and laughter. Marge will be missed by her family Jodi (James) DeCamp of Chokio, MN, Dale Besonen of Owatonna, and Lynn Colvin of Medford, MN. Marge’s grandchildren Daniel (Heidi Gruenhagen) DeCamp, Derek (Charlotte Jackson) DeCamp, Angela (Eric Brandenburg) Colvin and Maria (Craig) Kelling. Great-grandchildren James DeCamp, Braelynn and Keira Kelling, and Holden DeCamp. Sisters Irene Wierzbinski of Owatonna, Marie (Len) Csiszar of Pacific Palisades, CA, and Evelyn Sefton of Howell, MI. Sister-in-laws Elizabeth Kummeth of Goshen, IN, Helen Kapral, and Cheech (Jim) Middleton of North Mankato, MN. As well as many nieces, nephews, and cousins. Marge is preceded in death by her husband Gordon, parents, brothers Francis, John, George and Eugene Kummeth, sister-in-laws MaryLou and Kay Kummeth, and brother-in-laws John Wierzbinski and Paul Sefton. In lieu of flowers, memorials are preferred to St. Mary’s School of Owatonna or Susan G. Komen.